Personalized custom musician playing the piano bobblehead - a love more than a gift! It has been said that music is the food of love and what better way to project this view than with a music or musician Bobblehead? 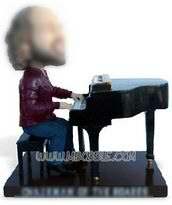 Demonstrate your love of music or clearly show your admiration for a genre or particular musician with a music or musician Bobblehead. Commission a Bobblehead with yourself as the focus or select your favorite musician as the subject and you will be sure to attract the adulation of your fans or those who share your passion for music.